By and large, there seems to be a general consensus about the ideals to which modern performances of Palestrina should aspire. Most seem intent on balancing the clarity afforded by clear articulation and even balance between the voices with a warm, all-embracing aura, either from a generous acoustic or from homogeneity of choral tone. By those standards, this is a remarkably successful recording. Ensemble Officium is a relatively small choir, seventeen singers are credited, but has plenty of power in reserve for Palestrina’s more opulent textures. Some may find the readings a little on the dry side, dry for Palestrina that is, and certainly clarity is the overriding concern here. The balance between the voices is impeccable, as is the articulation of the texts. Pope Macellus would surely have approved, as he would that the texts are also provided. The liner notes go into some detail about why these works are performed a fourth lower than notated. Whatever the historical justification, the musical benefits are clear. The sopranos are never strained, the alto lines are taken by tenors, adding to the evenness of the tone, and none of the lower voices is ever compromised by the tessitura. The recorded sound is exquisite: clear, warm and above all involving. There is no surround mix, but the stereo SA-CD layer demonstrates all the other virtues that this technology can field. In fact, those Trentine ideals of clarity and engagement are ideally met through the combination of a smallish choir and high-specification recorded sound. The programme breaks up the Missa Papae Marcelli with interpolated plainchant and motets by Palestrina. The idea is to recreate the music of an Ascension Day service from Palestrina’s time. 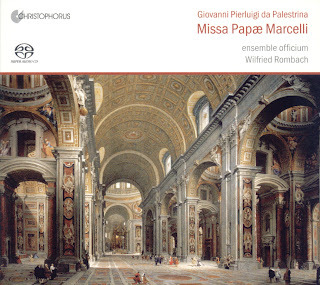 From a purely musical point of view, this has the effect of introducing a range of Palestrina’s lesser known but equally fine works into the flow of his famous Mass. The ordering is probably not to everybody’s taste, but I surprised myself in not skipping the Gregorian chant, which is sung here (often in small unison ensembles) with an unadorned and unornamented simplicity. Stylistically, it is the ideal compliment to Palestrina’s strivings for polyphonic clarity. When it comes to Papae Marcelli recordings, the field is already crowded, but even so this disc deserves recommendation. If you like boy’s voices on the top lines, driving tempi or halo-like cathedral acoustics, give this one a miss. On the other hand, if you like clarity, engagement, precision and top-notch audio, this could be the Papae Marcelli for you.